First you must register a Trial account. 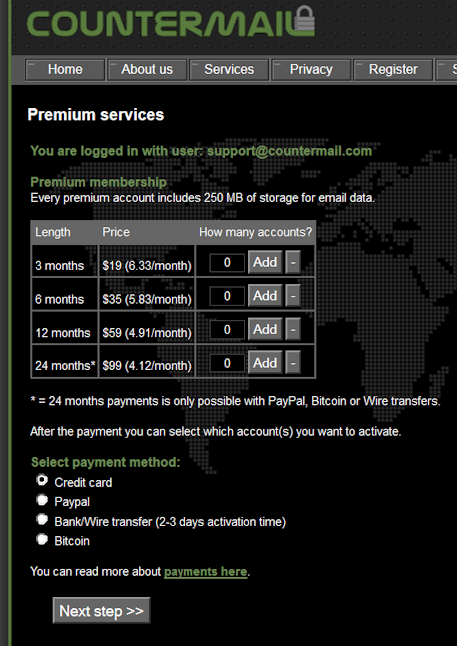 Login to your account, click on "Add premium services" in your upper left button. If your account has expired you will see the upgrade link under the Login window. When you buy premium subscriptions, your premium time will be added to your account expire date, you can find the expire date under Settings / Account info. If your expire date is older than then renewal date, the premium time will be added to the renewal date instead. You will be notified, by email, of a pending expiration 10 days before your account's expire date. A second email will be sent to you 3 days before the expire date. NOTE: PayPal payments has been replaced with Stripe.